Spencer Baird is named head of U.S. National Museum on January 1, 1872. Smithsonian Secretary Joseph Henry issues a memo stating "the Assistant Secretary shall have special charge of the collections of the Institution, and of the National Museum, and shall direct the operations connected with them subject to the approval of the Secretary." 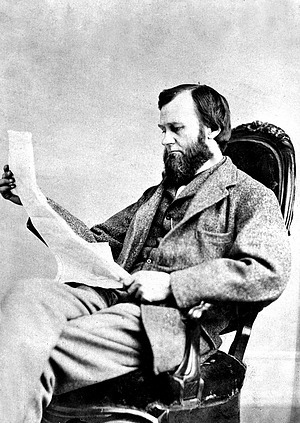 Baird would succeed Henry as Secretary of the Smithsonian after Henry's death in 1878. 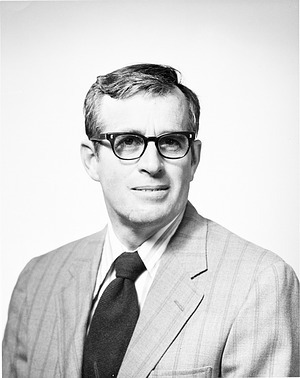 Leonard B. Carmichael takes office as seventh Secretary of the Smithsonian, and he serves for eleven years, 1953-1964. He is the first Secretary selected from outside the Institution. 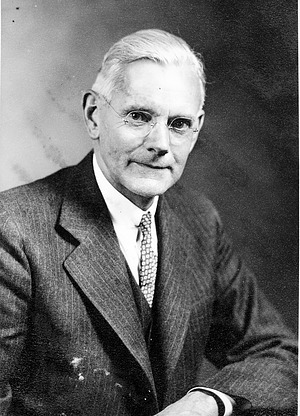 For fourteen years prior to his appointment, he was president of Tufts College. As a physiological psychologist, Carmichael is the author of a standard manual of child psychology. 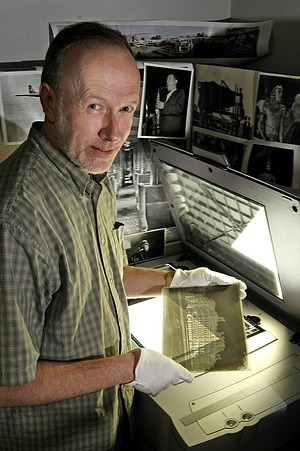 Charles Lang Freer first offers his art collection to the Smithsonian Institution. President Theodore Roosevelt has to convince the Board of Regents to accept the gift, and the formal deed of gift is signed May 5, 1906. The American Historical Association is incorporated by the U.S. Congress and is ordered to report annually to the Secretary of the Smithsonian Institution. The collections, manuscripts, books, pamphlets, and other material for history are to be deposited in the Smithsonian's U.S. National Museum. The first report is transmitted to Congress in the spring of 1899. 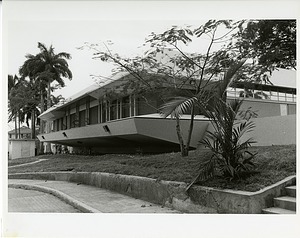 Groundbreaking ceremonies begin construction of the Earl S. Tupper Tropical Sciences Library serving the Smithsonian Tropical Research Institute in the Republic of Panama. Alexander Wetmore, sixth Smithsonian Secretary and ornithologist, conducts field work on and near Coiba Island, Panama on January 6, 1956. Wetmore traveled to Panama for many years and wrote the seminal book on the birds of Panama. Coiba Island, then a penal colony, provided Wetmore with a largely undeveloped area where birds flourished. 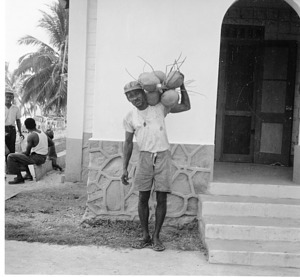 Many of the local Panamanians and some of the convicts assisted Wetmore with his field work. As of January 7, 2008, Smithsonian Photographic Services became part of Smithsonian Institution Archives, reporting to Archives director Anne Van Camp. In FY 2005, after a workforce analysis, photographic services were decentralized to Smithsonian units. The Director's Office and Photographic Archives were placed under the Office of Public Affairs. Given the importance of the Photographic Archives and its role as a major Smithsonian historical collections, Photographic Services was moved to the Smithsonian Institution Archives. Efforts will focus on preservation and enhanced access to the collection. 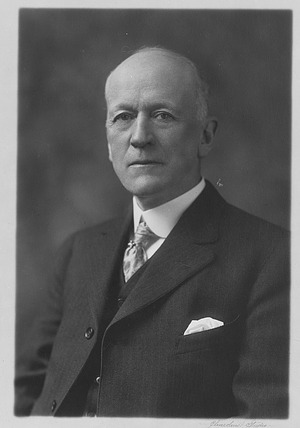 Senator Rufus P. Choate of Massachusetts gives an impassioned and urgent speech to the U.S. Senate, advocating the establishment of a grand and noble public library with the James Smithson bequest. He recommends that the contemplated Smithsonian Institution allocate $20,000 a year for twenty-five years toward such a project. Due in part to his efforts, the final bill which establishes the Smithsonian Institution contains a provision for a library. 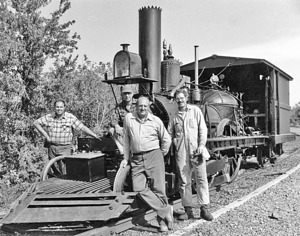 In anticipation of a possible track run (finally accomplished September 15, 1981), the John Bull steam engine is tested in the National Museum of American History using compressed air. 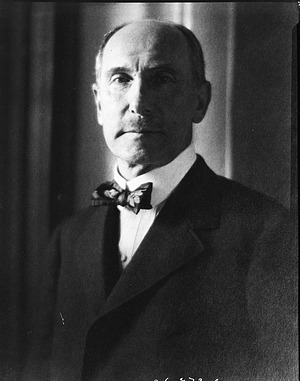 Charles Greeley Abbot is elected the fifth Secretary of the Smithsonian Institution by the Board of Regents and serves a sixteen year term from 1928 to 1944. He first came to the Institution in 1895 as an aid at the Smithsonian Astrophysical Observatory after receiving his master's degree from the Massachusetts Institute of Technology. Upon Secretary Samuel P. Langley's death he had become director of the Astrophysical Observatory and in 1918 Assistant Secretary. 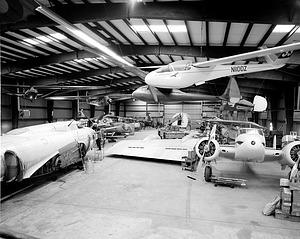 The Silver Hill Museum, with several buildings of displays and the restoration facility of the National Air and Space Museum, opens for public tours at Suitland, Maryland. 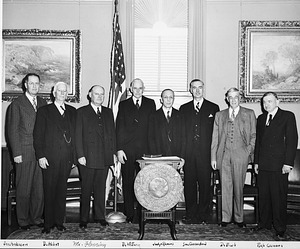 Alexander Wetmore is elected the sixth Secretary on 12 January 1945 by the Board of Regents and serves a seven year term from 1945 to1952. A noted ornithologist, he had been associated with the Institution since 1924, when he served for a short time as director of the National Zoological Park. He had also served as Assistant Secretary in charge of the U.S. National Museum. Alexander Graham Bell demonstrates his telephone for Secretary Joseph Henry and his daughters at the Smithsonian, and at a meeting of the Philosophical Society of Washington that evening. 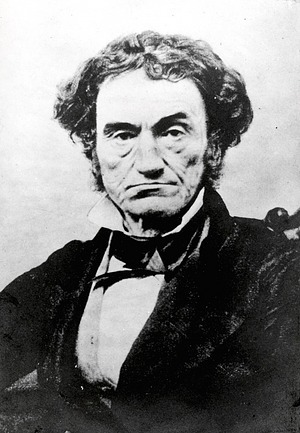 Bell's first telephone patent had been issued on March 7, 1876, and a month later, Bell transmitted the first intelligible human speech over the telephone. As a judge for the 1876 Centennial Exposition in Philadelphia, Henry submits a report praising Bell's invention. Bell's second patent, covering the "box" phone as transmitter and receiver that he demonstrates during his visit to Washington, would be issued January 30, 1877. Invertebrate paleontologist Porter M. Kier is appointed director of the National Museum of Natural History. He succeeds Richard S. Cowan. Kier serves as director until May 30, 1979, when assistant director James Mello is appointed acting director. The National Portrait Gallery unveils the John Singleton Copley self-portrait, a gift from the Cafritz Foundation. The Chase Manhattan Money Collection of more than 24,000 pieces is given to the Smithsonian's National Museum of History and Technology, now the National Museum of American History. Due to ever-growing collections, the Smithsonian Board of Regents presents a resolution to the U.S. Congress requesting an appropriation of $300,000 to enlarge the U.S. National Museum by erection of a fireproof building on the southwest corner of the Smithsonian Reservation. This request is less than two years after the National Museum Building, now the Arts and Industries Building, is opened. It was not until 1902 that Congress appropriated funding for a new U.S. National Museum, now the National Museum of Natural History. The first cable telecast of Smithsonian films, Celebrating a Century and The Smithsonian Institution with S. Dillon Ripley, Secretary, are aired through arrangements between the Office of Telecommunications and the Appalachian Community Service Network. 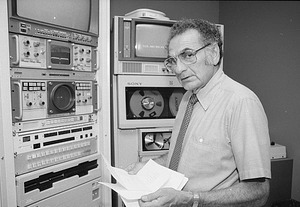 The film, The Smithsonian Institution with S. Dillon Ripley had received two Emmys in June 1979 from the Washington, D.C., chapter of the National Academy of Television Arts and Sciences. 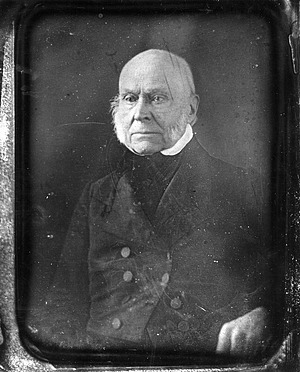 Former President John Quincy Adams, now in the U.S. House of Representatives from Massachusetts, issues a report on the James Smithson bequest, urging that the United States accept it. 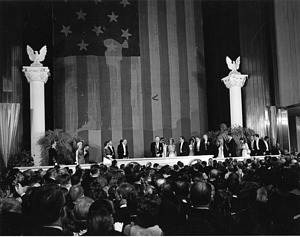 President Richard M. Nixon's main Inaugural Ball is held at the National Museum of History and Technology, now the National Museum of American History. Robert McCormick Adams is named the ninth Secretary and assumes the post on September 17, 1984, serving for ten years from 1984 to 1994 . 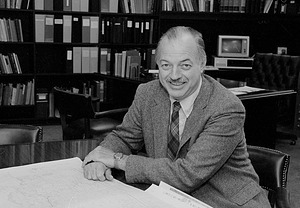 Adams was Provost of the University of Chicago from 1982 until 1984. In his scholarly work and twenty-seven years of field research, Adams has focused principally on the agricultural and urban history of the Near and Middle East and the geographical and archaeological study of settlement patterns. A snowstorm forces the Smithsonian to close at 12:30 p.m. on Thursday, January 22. The Smithsonian is also closed all day on Monday, January 26. This is the first time the Smithsonian had closed because of inclement weather since January 13, 1983. The National Zoological Park is closed for half days on the 22nd and 25th, and all day the 26th. 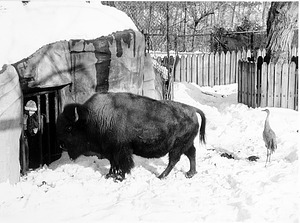 At least two keepers spend the night sleeping in the Antelope House, to tend the animals. On January 23, 1964, the Smithsonian's new Museum of History and Technology, now known as the National Museum of American History, opens to the public and on the first weekend, some 54,000 visitors viewed the new museum. 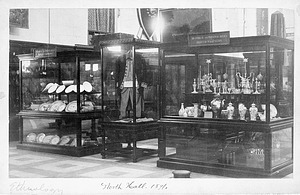 The halls opened included the Flag Hall, First Ladies' Hall, and the halls of Everyday Life in the American Past, American Costume, Farm Machinery, Light Machinery, Tools, Vehicles, Railroads, as well as a temporary exhibition presenting examples of exhibits to be installed in other halls of the building. 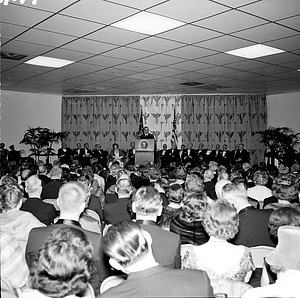 The building was dedicated by President Lyndon B. Johnson on January 22, 1964. 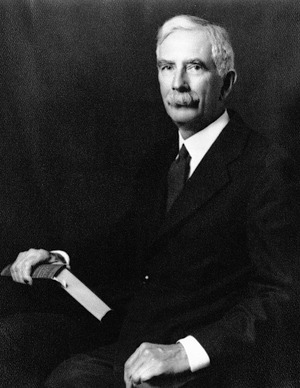 Charles Doolittle Walcott is elected the fourth Secretary of the Smithsonian Institution and serves a twenty year term from 1907 to 1927. Walcott was a well-known paleontologist and explorer, who had succeeded John Wesley Powell as director of the U.S. Geological Survey. 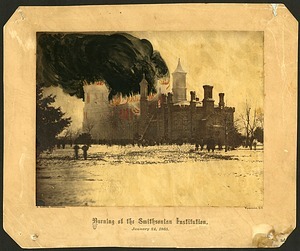 Fire destroys the roof and all the interior of the upper story of the main building of the Smithsonian Institution Building, the interior of the two large north towers, and also of the large south tower. The personal effects and mineral collection of James Smithson are destroyed, with the exception of his portrait and library, as well as the contents of Secretary Joseph Henry's office, including correspondence, scientific papers, diaries, and the completed manuscript of the annual report. Also lost in the fire are many meteorological records, scientific instruments, including those donated by Dr. Robert Hare, and the John Mix Stanley portraits of American Indians. 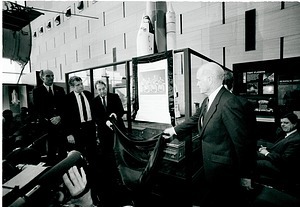 Alexander Graham Bell, a Smithsonian Regent, brings James Smithson's remains from Genoa, Italy, to the United States. 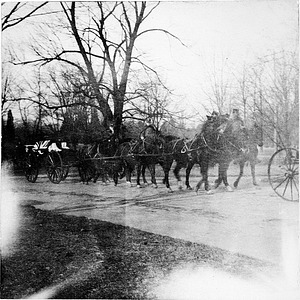 After a procession from the Navy Yard to the Smithsonian Institution Building, Bell hands over Smithson's remains with the words, "And now...my mission is ended and I deliver into your hands...the remains of this great benefactor of the United States." The remains are temporarily situated in the Regents Room accompanied by the few remaining personal relics of Smithson. In 1905 the crypt containing Smithson's remains is created at the north entrance of the Smithsonian Building. More than 800 people attend the opening of the Hall of Everyday Life in Early America, officiated by Secretary Leonard Carmichael. 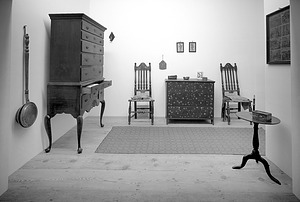 It is the first hall in the Museum to be devoted to cultural history, and includes an entire 17th century Massachusetts Bay Colony house, three 18th century rooms, an early 19th century bedroom, and a New England schoolroom equipped with original desks and benched. 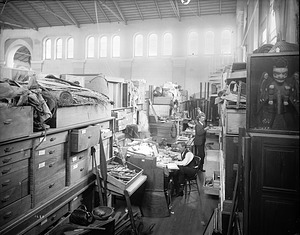 The hall, curated by the Department of Anthropology, occupied approximately 180 x 55 feet of the second floor of the Natural History Building. The Renwick Gallery, designed by 19th century architect James Renwick, Jr., opens in the former Corcoran Gallery of Art Building next to Blair House. 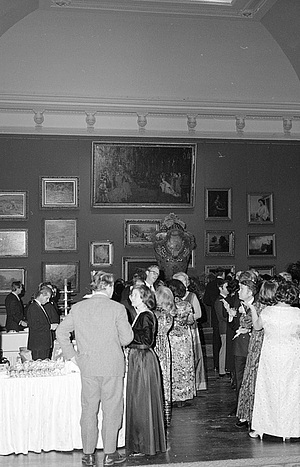 The gallery is devoted to American creativity in crafts, design, and decorative arts and is a curatorial branch of the National Collection of Fine Arts, now the Smithsonian American Art Museum. The Board of Regents passes a resolution accepting the Norman plan and design of New York architect James Renwick, Jr., for the Smithsonian Institution Building, known as the Castle. The Board also decides that the western range and western wing of the building are to be reserved for a gallery of art. Orchids: A View from the East opens at the National Museum of Natural History. This exhibit is one of the annual orchid exhibits the Museum puts on display in cooperation with the Smithsonian Gardens and the U.S. Botanical Gardens. 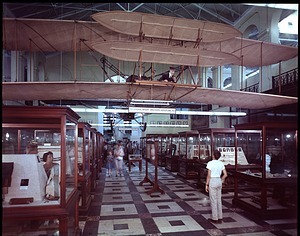 Upon the death of Orville Wright on January 30, 1948, the Smithsonian's U.S. National Museum learns that Orville Wright had instructed that the original Wright Flyer, the first aircraft capable of flight carrying a man under its own power, which first flew on 17 December 1903, should be donated to the National Museum. This donation ends a long dispute between the Wright Brothers and the Smithsonian over the first machine capable of flight. The Space Hall of the National Air and Space Museum is "filled to overflowing" with hundreds who come to watch the telecast of the memorial service for the crew of the Space Shuttle Challenger from Houston. The Space Shuttle Challenger exploded during launch on January 28, 1986. As is the custom with all space launches, video monitors had been set up in the Museum for the visitors to witness the launch, so the disaster was witnessed by dozens in the Space Hall.